Brown patch, Rhizoctonia Solani, is the most serious lawn disease during the summer in tall fescue lawns of Northeast Tennessee. The symptoms are characterized by brownish-tan spots in the leaf blade, leaf sheathes and stems. these areas appear as circular patches of thinned or blighted turf several inches to a few feet in diameter. 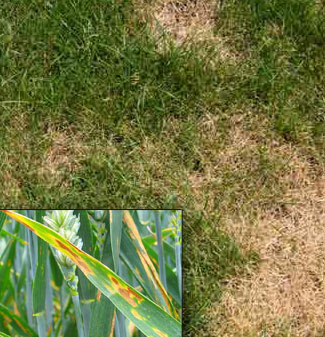 Brown patch disease is spurred by hot humid weather, poor soil drainage and a healthy lawn. Cool, wet weather in late spring increases the severity of brown patch in some grasses. By establishing good lawn care practices with the properly formulated applications from Mr. Green Thumb, your lawn will be in the optimum condition to limit brown patch from developing. ©2014 Mr.GreenThumb.com. All Rights Reserved.